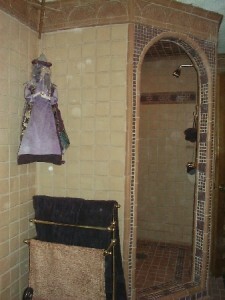 This large walkin shower is completely tiled with built in soap caddies and hooks for hanging scrubbies. The Fan Frieze continues around the top of the walls and a band using a 3×3 geometric and 1×1 field tiles decorate the shower. This pattern is repeated on the shower floor. Arch molding nicely finishes the doorway.